BEIJING: Prime Minister Imran Khan met his Chinese counterpart Li Keqiang on Saturday and 15 agreements and memorandums of understanding (MOUs) for cooperation in diverse fields were signed between the two countries. The agreements were signed during delegation-level talks between the two countries at the Great Hall of the People in Beijing. Khan, who is on his first official visit to China after assuming charge as prime minister, led the Pakistani delegation which included Foreign Minister Shah Mehmood Qureshi and Finance Minister Asad Umar among others. The Chinese delegation was led by Prime Minister Li Keqiang. Agreements pertaining to poverty alleviation in Pakistan, strengthening coopseration in agriculture and industrial sectors and technical training were signed by the two sides. It was also agreed that China will support Pakistan in establishing special economic zones, according to sources. A document on strategic-level talks between foreign ministers of two countries was also signed. The two countries also signed MoUs for cooperation in forestry, earth sciences and transfer of electronics. Agreements were also signed between Higher Education of Pakistan and Science Academy of China and between Chinese Academy of Science and Pakistan Metrological Department. 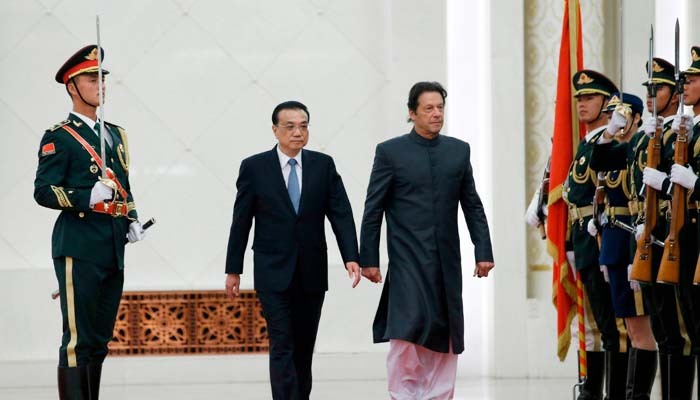 Upon arrival at the Great Hall of the People, the Chinese premier accorded warm welcome to PM Imran and an official welcome ceremony was held during which a guard of honour was presented to the Pakistani prime minister. Earlier today, the premier laid a floral wreath at the Heroes Monument at Tiananmen Square. PM Imran reached China on Thursday night, where he was welcomed by Chinese Transport Minister and Ambassador to Pakistan, Li Xiaopeng and Yao Jing, respectively, at the Beijing Capital International Airport. Pakistan is expected to receive $6 billion economic package from China during PM Imran’s visit, sources earlier said. A loan of $1.5 billion and a grant of $1.5 billion are expected to be offered, along with an additional package of $3 billion for CPEC. $1.5 billion are expected to be deposited in the State Bank of Pakistan, while Pakistan Railways may also be included in the package.